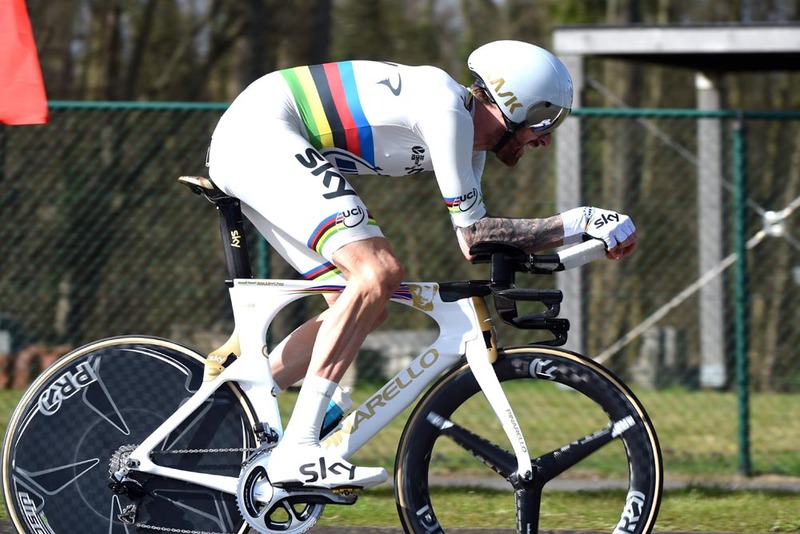 Sir Bradley Wiggins won his first time trial in the rainbow jersey of world champion today in the Belgian stage race, the Three Days of De Panne, and he did so after a overcoming a virus and a round of antibiotics. Sky’s captain fell sick after racing in Paris-Nice and doctors believed he had shingles. After taking antibiotics and skipping the E3 Harelbeke classic, he has returned on top. Today in Belgium, he won the 14.2-kilometre time trial on the coast in De Panne. It was his first win since winning the worlds in Ponferrada, Spain, in September and will be his last major time trial in the rainbow stripes. The win sets him up for the Tour of Flanders this Sunday and Paris-Roubaix, his last race with Sky, next Sunday. “I was a bit sick at the start of last week, I thought I had shingles,” Wiggins said. Wiggins won the time trial by 10 seconds over Stefan Küng (BMC Racing), which was enough to move him to third overall. The three-day stage race included a split stage in the final day, a short 114.4-kilometre road stage won by victor of the first two stages, Norwegian Alexander Kristoff (Katusha). In the afternoon, Wiggins flew his rainbow colours. The time trial was only Wiggins’s second since winning in Ponferrada. He raced the Tour of Qatar time trial in February and placed third to Dutchman Niki Terpstra and Swiss Fabian Cancellara. “To be honest, it’s nice to go out like this with this jersey on, winning a race and I’d hate to get lost in the next couple of years, punch drunk like some old boxer who can’t leave it alone. I had my time,” Wiggins added. Wiggins raced the Three Days of De Panne as a first-year pro 13 years ago in 2002 with French team, Francaise des Jeux. He placed 12th in the time trial. 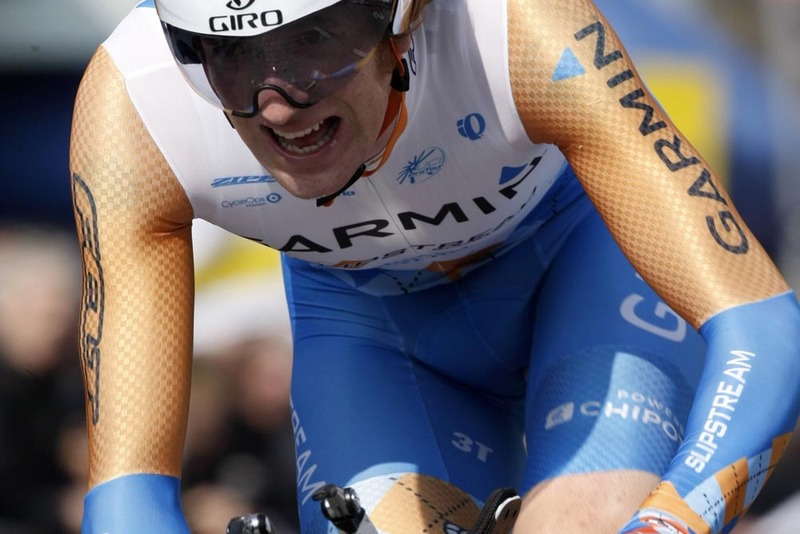 He returned, with American team Garmin-Slipstream, and won the time trial in 2009. “This is probably my last one on this level. It’s been on my mind today and all week, I really wanted to win this one,” Wiggins said. The sun came out and the wind died down slightly today on the coast, but still blew cold air around at about 15mph.